Paris. Venice. Florence. Rome. Pisa. London. France, Italy, and Great Britain. Planes, trains and automobiles. Oh, my! Forget Gangnam Style. We roll Griswold Style! "I really want to go to Italy." Ok, mom, what part of Italy? "Um, I want to see the gondolas in Venice and I guess Rome. Or the ocean." You know the ocean is cold this time of year, right? "No. Maybe not the ocean, then. How about London? I'd like to go to London." London isn't in Italy; that's a whole other country. "Yes, I know, smartypants. Can we only go to one country the whole time I'm there?" So, yeah, mom, you asked for it! You wanted to see the Eiffel Tower? 2 hour train ride and tons of metro hopping, but you saw it! You want to see Italy? Dude, we saw the whole northern part of Italy! London? You got it! But that's another post. I know she was worn out (heck, we all were! ), but I really do hope my mom had as much fun as I had on this trip. Italy is fantastic! If you haven't been, I highly recommend it. We flew into Venice then took the train to Florence and Rome and Pisa. In retrospect, I wish I hadn't let Mike be in charge of buying train tickets. It cost roughly double for the fast trains but would have been so worth it! As it was, each train ticket only cost around 20-25 euro for each leg of the trip. Even at double for the nicer train and better itinerary it would not have been cost prohibitive at all AND we would have had more time to walk around and see more stuff. But I let Mike handle it and he loves saving money so we took the slow train. Hanging out in San Marco Square. 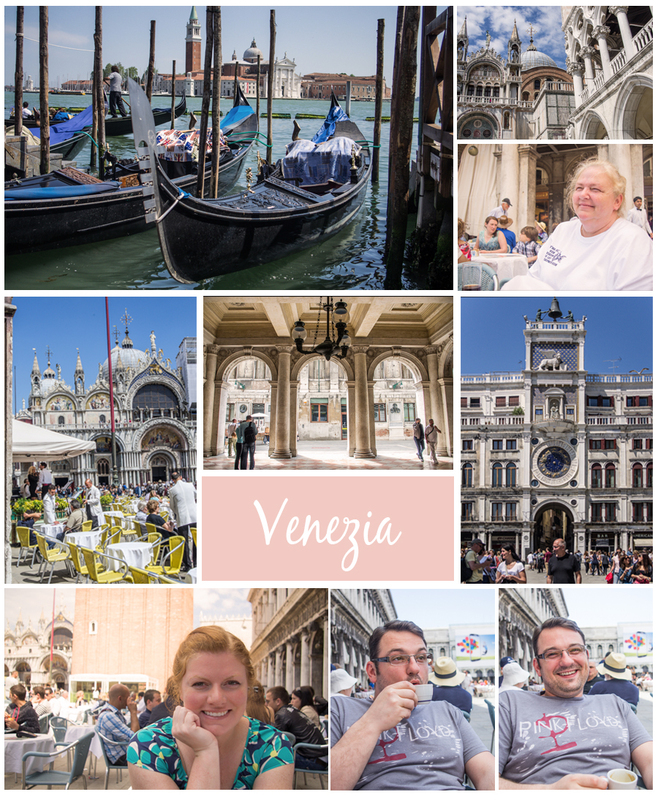 I only planned one day in Venice and if you've got other places to go, that's plenty of time to see Venice. It's very small. 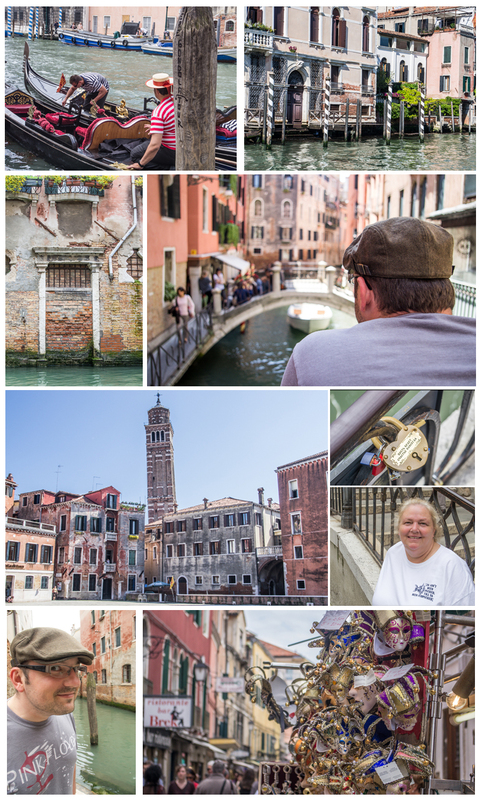 We meandered along the canals to San Marco Square, had a snack and some coffee, and then walked back along the Grand Canal for a bit before hopping onto the water taxi. Travel tip: In Venice, there are several "water taxi" companies, to include the pricey gondola rides. The least expensive option is the public transportation. Think public buses or streetcars but on water. I think it was around 8 euro each for a hop on and off pass for a few hours. I don't remember the details because we were simply heading back to the main hub to catch the train to Florence, but it didn't cost very much even for a day pass. Some of the other companies cost as much as 20-40 euro per person for a couple of hours and the gondola rides were 80 euro for a 30 minute ride. Of course, those options have the benefit of a tour guide so decide what will work best for you. We just wanted a ride from point A to point B. I wish I had done a tiny bit of research and known about the public water taxi because some of the canal streets were very crowded and it was hot out. Riding along the Grand Canal was a really pretty way to see Venice. What's funny to me is how my feelings for and/or about Venice change constantly. One moment I'll be ok with not visiting there again. The next instant I want to book a trip for Carnivale or just a long weekend. Perhaps Venice really is a "splendor of miscellaneous spirits" (John Ruskin)... and perhaps I've been touched by one.